Grit Blasting is often incorrectly called Sand Blasting because people used sand before they found out its limitations and dangers. When a piece of sand hits the metal it pulverizes on contact therefore has very little energy left to actually move the corrosion. It takes much longer to clean the pipe and polishes it rather than leaving the correct surface profile or "key". Medium size grit is best. PLCS recommends Black Beauty Medium (Coal Slag) from Harsco Minerals www.harsco.com/minerals, EG 14 (Copper Slag) from Opta Minerals www.optaminerals.com or 1240 Medium Grade Patriot Blast (Coal Slag) from Ensio Resources, Inc www.ensioresources.com used with a 1/4" tungsten carbide lined nozzle, such as a Clemco CT-4, for longer life. Clemco Model 1042 PLCS recommends Clemco Model 1042 (pictured) 1 Cu. ft. Classic Blast Machine System or similar for any Encapsulation leak sealing campaign. 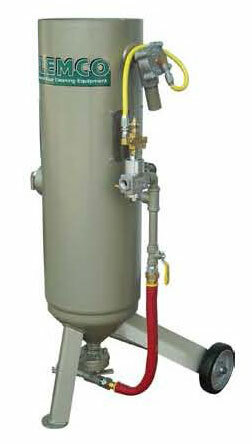 This is a field-portable industrial quality blast machine rated at 125 psi working pressure. The Model 1042 holds 100 lbs of abrasive grit (media) providing about 15 minutes of blasting at 80 psi with a No. 4 (1/4") nozzle. One-man operated with remote control dead man at the nozzle for safety and efficiency. An optional cool air tube assembly can supply cool air to the helmet to keep the operator cool during hot weather. It also comes with a state-of-the-art NIOSH-approved respirator, which requires its own air supply. You must use a Breathing Air Filter to supply air from your compressor or an Ambient Air Pump to supply clean, cool, oil-free air to the operator. IMPORTANT - There must be no oiler on the air line from the compressor. The operator must not be allowed to breathe air contaminated with oil and oil will be deposited on the pipe joint so the sealant will not adhere to it. Please review the brochure for details and typical blaster packages. Call PLCS for a quote. To clean down to bare metal the grit must hit the surface with sufficient force. The right combination of air pressure, air volume and blast equipment components will quickly remove the scale from the pipe. We recommend 100 psi from a 100+ CFM (cubic feet per minute) compressor. A 1/4" nozzle used with medium size grit achieves the best result for our purpose. The nozzle restricts the passage of air and grit. The compressed air speeds up as it passes through the nozzle, accelerating the abrasive in the air stream. As the inside of the nozzle wears the mixture slows down and you lose pressure. When the operator notices a loss of production it is time to replace the nozzle. PLCS recommends a 25´ x 1/2" ID blast hose for good results. Using a longer hose and bending or looping it will cause a drop in pressure. Friction against the walls of the blast hose will slow the grit velocity. Try not to use a longer blast hose than is necessary. The media valve at the bottom of the tank determines how much abrasive grit mixes in with the air going to the nozzle. Use far less grit than air, so it feels like 10% grit to 90% air. When first starting to blast, keep the media valve closed and run air only for a few minutes to clear the hose of any residual grit and remove any moisture from the hose. Then open the media valve a little at a time to introduce a small amount of grit into the airstream. The operator will notice when the optimum amount of grit is in the airstream because it is cleaning most efficiently and he can hear a steady abrasive flow. Too little abrasive causes a high-pitched sound and too much an erratic pulsing. Experiment until optimal flow is achieved. During the blasting operation keep the nozzle about 2 to 3 inches from the pipe surface at a slight angle from straight on. Move the nozzle with a smooth constant stroke. Do not whip the nozzle back and forth, or concentrate in one area, both will result in a lack of productivity. Always use clean, dry air and grit. 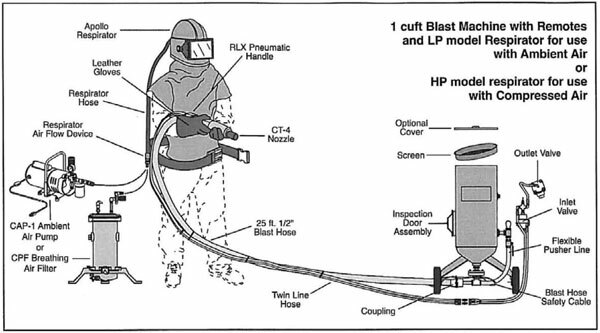 At the end of each work day empty the blast hopper and blow out any residual grit from the hose by operating the blaster until only air is exiting the hose. If grit is left in the blaster overnight, humidity will cause the grit to clump together, clogging the nozzle and making it close to impossible to use the next day. 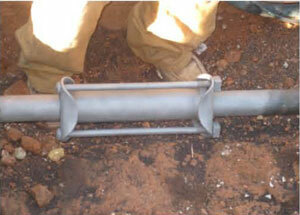 Use a high quality compressor air line water separator to prevent any moisture from entering the blast hose. 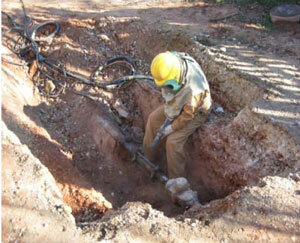 Moisture impedes the overall blasting operation and discharges water onto the pipe. This will affect the adhesion of the sealant to the pipe and may result in a failed repair. NEVER use an oiler on the compressor air line.